The Westminster Arcade, in Rhode Island, is famous for reasons more than one. 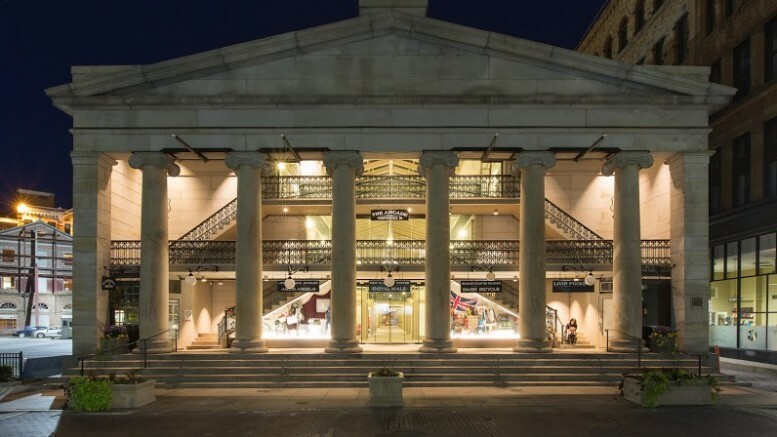 It is considered to be the very first indoor shopping mall in the history of the United States; was officially classified as a National Historic Landmark back in 1976; and is now an exemplary architectural specimen that champions the cause of modern micro living. 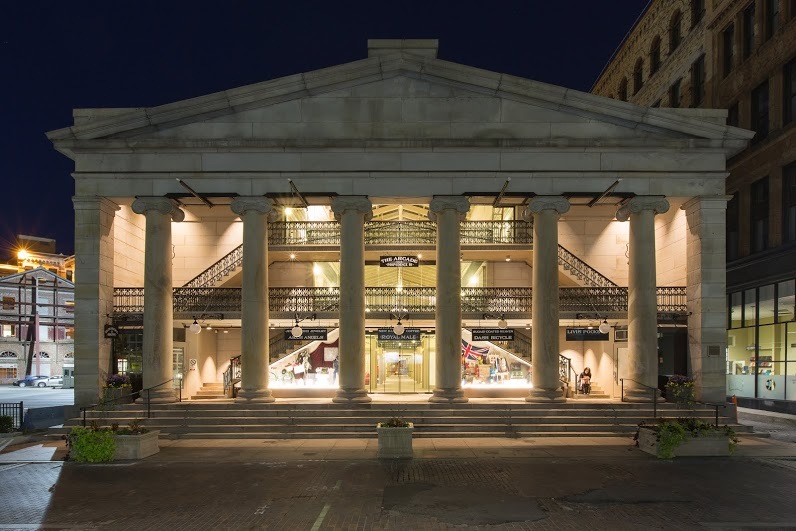 Also known as the Providence Arcade, the three-storied enclosed mall was built in 1828 by the architect duo, Russell Warren and James Bucklin. It was designed in the Greek Revival style of architecture, with huge Ionic columns lining the front and the back entrances of the building. Other notable features include a majestic well-lit atrium, surrounded by shops on all sides , and a transparent glass gable roof. Although an important commercial hub in the 19th and early 20th centuries, by 1944 the Westminster Arcade was already on its way to ruin. A major renovation attempt was undertaken by Irving B. Haynes & Associates, in the 1980s, to restore the shopping complex, however it kept on struggling till it was finally closed down in 2008. Furthermore in 2010, it featured in the Providence Preservation Society’s list of the 10 Most Endangered Buildings in the city. 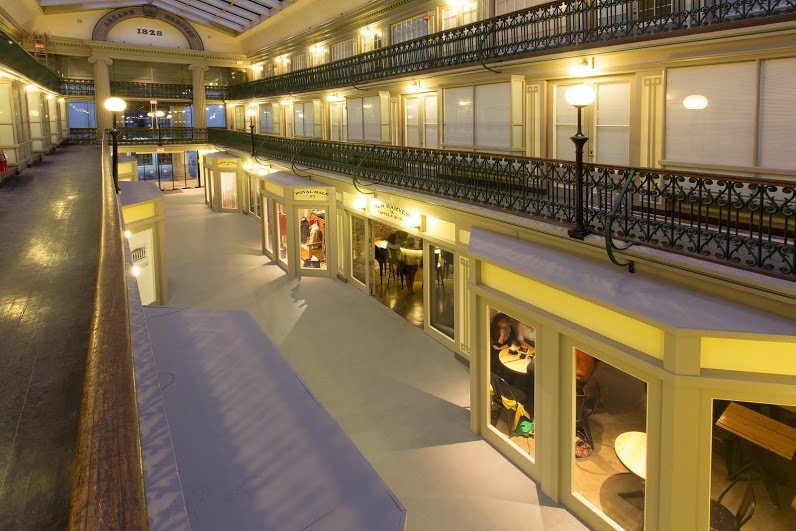 Fast forward to 2014, and the Westminster Arcade is a smart addition to the city’s landscape, with 17 mini-retail stores taking up the entirety of the first floor and a total of 48 shoebox apartments on the second and third floors. It all started when developer Evan Granoff bought the building back in 2005. Granoff, together with the Northeast Collaborative Architects firm, embarked on the task of putting “the building back to what it was when it was built”. 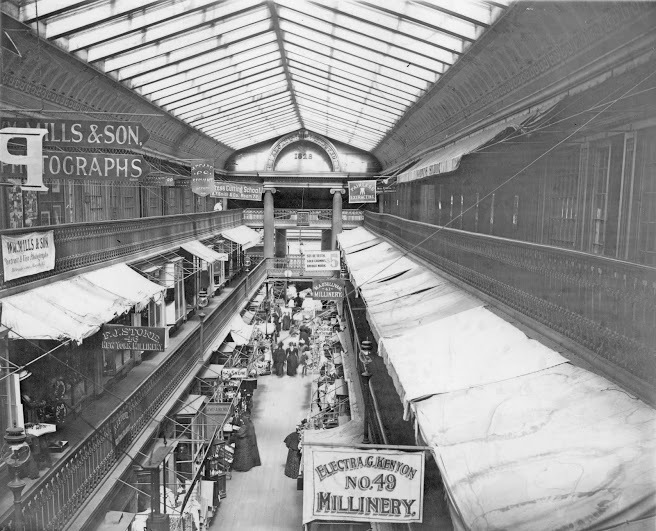 Among the other challenges faced by the team was the fact that over the 200-odd-years of its life, much of the Arcade got damaged, leaving behind uneven parts that proved extremely difficult to be reshaped. 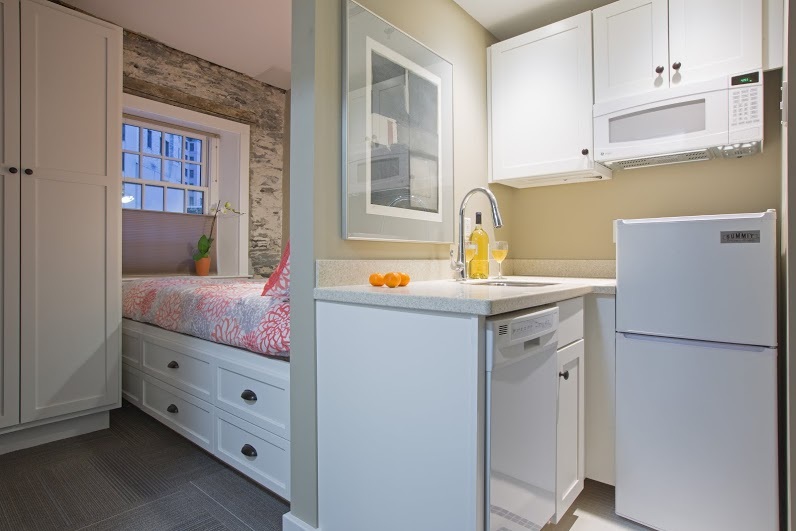 The $7 million worth restoration project, which was completed by 2013, included the creation and furnishing of 48 micro-lofts on the second and third floors as well as a common ground floor area dedicated exclusively to modern micro-retailing. 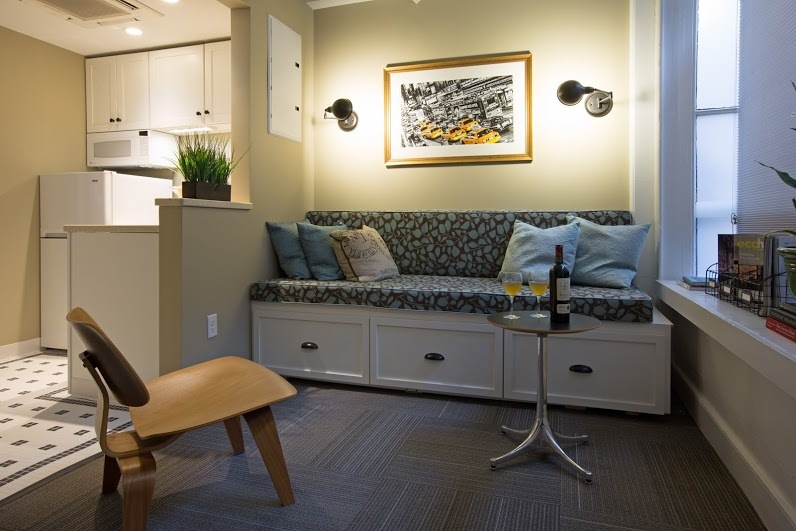 Each of these micro-living units, measuring 225 to 450 square feet, comprises of pre-fitted beds, bathroom complete with bathtub, a small but cosy living room, storage facility and a fully-equipped kitchen. The second-floor houses are also provided with guest rooms of sorts, made up of two strategically-placed Murphy beds. Additionally, the miniature-apartment complex contains common game and laundry rooms, to be used by all the tenants. 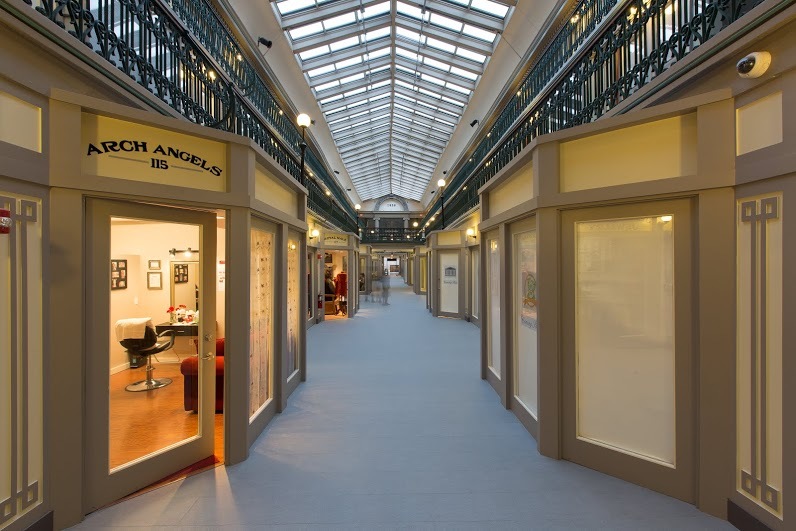 What is indeed noteworthy are the incredibly innovative ways in which the present-day Providence Arcade makes use of limited floor space to construct mini-dwellings that are complete in themselves. The design also successfully optimizes natural lighting, by means of huge double-hung windows that surround the building on all sides. With rents starting from $550 a month, these comfy shoebox apartment units are perfect for “young kinds that just graduated”. Interestingly, the project has already won a slew of architecture awards, including the 2013 AIA RI Design Award for Historic Preservation, the RI Smart Growth Award for Outstanding Smart Growth Projects of 2014 as well as a special mention at the 2014 REHAB conference. To learn more about NCA Architects and the project, click here.